Enjoy a one-of-a-kind walk through time and space in the company of a professional guide brimming with fascinating stories, anecdotes, and fun facts about Chicago's history and people. The casually paced adventures provide an opportunity for both locals and visitors to explore varied neighborhoods, culture, food, architecture, shops, bridges, art, and parks! Wedding parties: perfect for out-of-town guests! Boat owners : explore the lakefront or Chicago river! Reunions: Show them your home! Spouses of conference attendees: keeps them entertained! Tours-R-Us is unique in that each tour can be customized to your group's specific interests. Pick the type of expedition, length, time, and date. 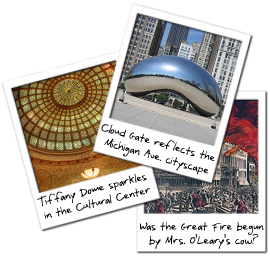 Explore the many layers and diversity of the Windy City whether you are fascinated by chocolate, lore, murals, cemeteries, designer clothes, or anything else Chicago has to offer! Find the best deal for car hire in Chicago, using the this leading hire comparison site.